This board books with full colour photos will steal the hearts of parents and children alike. In Pocket Piggies Colours!, the lovable piggies are featured alongside a yellow chick, a red guitar, a blue teacup (of course! ), and other impossibly cute props, to teach kids their colours. Introducing . 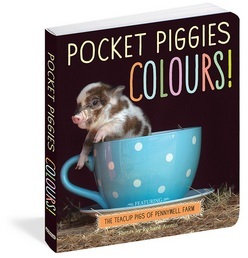 . . Pennywell Farm’s famous teacup pigs, in their board book debut!